Subscribe to our mailing list and learn everything you need to know about music lessons in Miami in just 15 minutes! group musicianship classes, consisting of music theory, ear training, and music history. SAM’s students have been accepted with scholarships into prestigious Universities including Berklee College of Music in Boston, University of Miami’s Frost School of Music, Florida State University College of Music, and New World School of the Arts. SAM’s students have also received Center and State Certificate of Excellence for obtaining the top marks at the local and state levels in their assessments from the Royal Conservatory Certificate Program. Our students have also won awards in international competitions such as the American Protege International Piano and Strings Competition, and have been selected to perform at Weill Recital Hall at Carnegie Hall. We are located in the Greenery Mall on 7734 N Kendall Dr. Miami, FL 33156. 1. Unique Music Program. SAM’s comprehensive program provides in-depth musical skills and professional mentorship to its students, whether they are applying to performing arts magnet schools, aspiring professional musicians planning to study music at university, or general music students. 2. Highly Qualified Faculty. All SAM faculty is comprised of experienced teachers with Masters and Doctoral Degrees in Music who are also active and renowned performers at the national and international levels. 3. State-of-the-Art Facilities. SAM students can receive private lessons in professional sound-attenuated music booths. This is a unique opportunity for students to experience lessons with optimal music sound in a top-notch setting. Our high-tech musicianship classroom includes an interactive whiteboard and projector for the ultimate music learning experience. Our grand pianos and digital pianos are made by Kawai, one of the leading manufacturers of pianos around the world. Our comfortable waiting area includes free Wi-Fi for parents. 4. International Music Certification Opportunities. Superior Academy of Music is a Founding School for The Royal Conservatory Certificate Program, the standard for assessment in music education at the pre-college level. 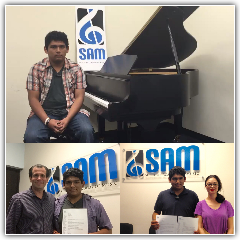 SAM’s students receive preparation for these national music assessments held twice a year. Students earn a National Certificate and written feedback from professionally trained adjudicators. SAM is also the local testing center for the Royal Conservatory so our students can take the assessments directly at our Academy. 5. Recital Performances Twice a Year Where Friends and Family Can Attend for Free. SAM Students to Perform at Carnegie Hall in NYC! We are thrilled to announce that three SAM piano students will be making their Carnegie Hall Debut, performing at Weill Recital Hall in New York City this Spring. 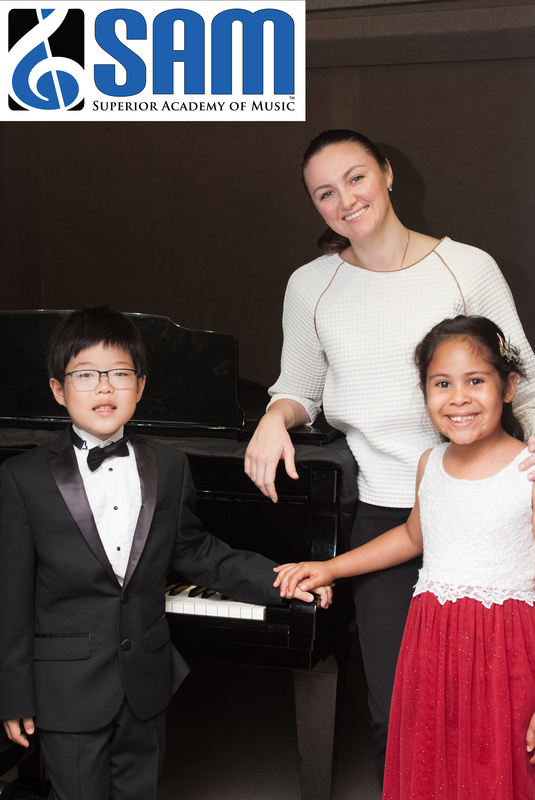 Zoe Aldana, Anastasia Bozhenova, and Ryan Kim, all students of Ms. Elena Fomicheva, will be featured as part of the Winners’ Concert organized by the American Protege International Piano and Strings Competition. Zoe Aldana won second place in the Young Musician’s category (ages 5-10). Anastasia Bozhenova won honorable mention in the Junior category (ages 11-14). Ryan Kim won honorable mention in the Young Musician’s category. We are incredibly proud of our students. All selected students and their teacher will travel to NYC in May. We wish them a fantastic experience performing in this historic concert hall. Congratulations to Ryan, Zoe, Anastasia and to our wonderful piano teacher, Ms. Elena Fomicheva! SAM Student Earns Full Tuition Scholarship at University! SAM student Nicolas Velasquez has been a student for the past 5 years since SAM opened its doors back in 2011. Throughout his studies, he has taken full advantage of SAM’s comprehensive program receiving lessons in classical piano, jazz piano, music theory, ear training, harmony, voice, digital recording and music production. He has been the recipient of several awards including Certificates of Excellence for earning top grades locally and state-wide in the national assessments from the Royal Conservatory Certificate Program. Most recently, he received a full tuition scholarship to pursue his music undergraduate degree at the New World School of the Arts. Congratulations to Nicolas and his teachers! To watch his testimonial about his experience at SAM click here.